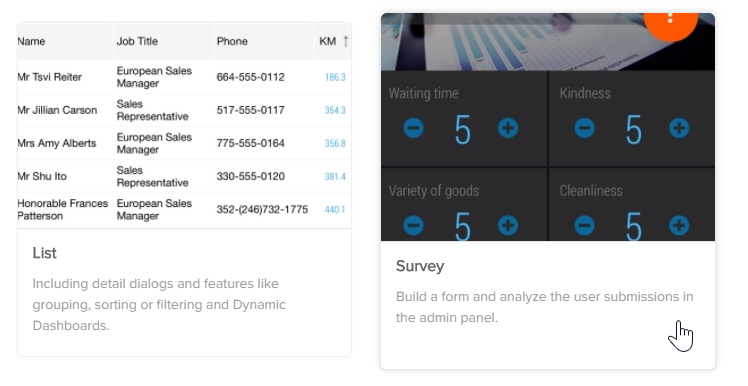 With Open as App you can mobilize existing Excel spreadsheets or Google Sheets within minutes. We enable automated app creation from Excel or business systems with a cloud-based tool that does not require any programming knowledge from the user. This way you can build forms and analyze the user submissions in the admin panel in the Open as App web portal. 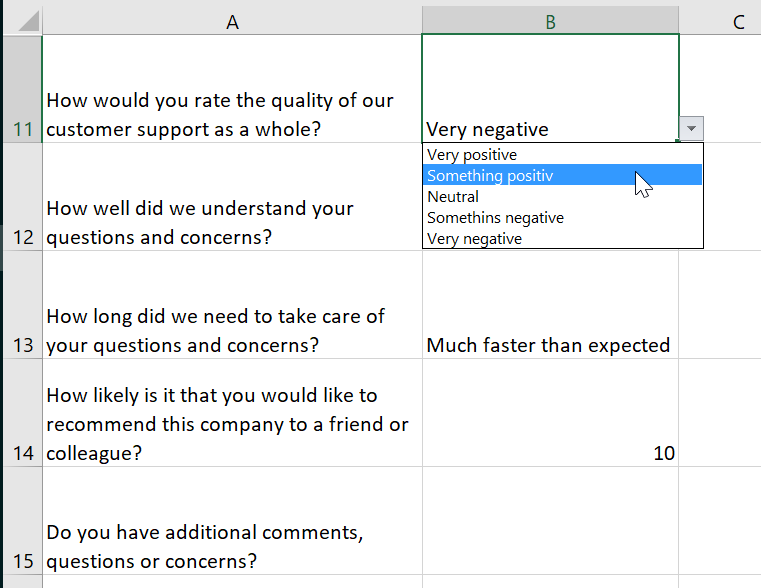 Creating mobile surveys based on Excel has never been easier. When clicking on the upload button in the app, users can submit the entered values ​​to the app's creator. The admin of the app sees all transmitted values ​​in the change protocol of the app. Create a survey app based on your spreadsheet. The data source for your app can be an Excel file with some questions, predefined response possibilities or freely definable text fields. In our example, the survey app should contain five questions, three of which can be answered via a selection list (function in Excel: "data validation"), one where users can give a numeric value, and one where the user can add a comment to the last question. In the first step of the app creation, we select this file as a data source. Select your survey Excel file in the "Select data source" step. In the "Confirm data" step, select the primary worksheet - that is, the one on which the questions for your survey app are formulated. Select "Survey" as the app template. This will automatically set all the settings required for a survey. Select the cells that you want the user to serve in your survey. It is not necessary to select the question itself, since this is automatically taken as "title" for the response cell. Just look at the preview on the right. After you select the relevant cells (in our example the cells B11 - B15), go to the next step in the design process. In the app designer, you can visually refine your app. In the individual menu items on the left side you will find additional options which are described in detail in the article "App Designer". Click "Next" to go to the "Create" step. Select the name for your app and add a description (optional). Click "Create app" to publish your app. Now everything is ready and your app is waiting to be shared and used with other people. New here? Your app can be opened and used with the "Open as App" app. "Open as App" is free for iOS, Android and Windows. Download "Open as App" in your store and log in with the data entered during registration. All apps you create are placed in the My Apps folder. How to download and use Open as App is described in the article "Open as App | Download and Login". In the article "The 1x1 of App Creation with Open as App" you will find detailed information about the individual steps. You can capture images in the app or select images from your device and upload them to the server when submitting the survey. The images are stored in the Microsoft Azure West Europe Cloud of Open as App. The link to the image is stored in the data log of the survey app. Please note that the image files are not inserted into the source file, so that they do not appear in the PDF printout etc. Then define the address - i.e. a cell from the data source with which this element communicates. Please note that the created image will not be inserted into the Excel cell. When sending the data, the image file is saved online and the link to this file is saved in the log. If you create an app based on this protocol (as described in section "Evaluate submitted data live in your own app"), you can see the images there directly. Make sure that the column type of the column in which the links to the images are located is defined as "image". You can see the data users have uploaded in your app in the change protocol. If there is no "Show change protocol" visible, please make sure the "Allow client changes" functionality is activated. The change protocol can also be downloaded as a complete excel file and handled further. You can import this file into one of your systems, for example. Below the table with all the data sets you will find the "download" button to download the whole change protocol as .xlsx file. In the previous section, you learned how to download the server-side log as a .xlsx file. Each time you click the download button, you will be redirected to a URL where the file is generated on-demand. You can use this URL as data source for creating your evaluation app! Every time you check the evaluation app for updates, a new copy of the log is loaded into your app. List Analysis Charts (if activated in your app) will be updated as well. Click the "Create app based on this data" button to start the app creation process with the server-side log. Right-click the "Download" button under the table with all the records. Click on "Copy address of the link" to copy the link to the clipboard. Select "List" as the app template. Define the visible columns for list view and detail view. In the "Design" step, you can also edit your app and, for example, activate the Dynamic Dashboard via the list editor. You will find detailed information on this function in the article "Auto-generated dashboard in lists". Select a name for your app and add a description (optional). Start your app in the "Open as App" application. Activate "Allows storing calculations" by switching the toggle.